The nRF905 is a radio transceiver IC similar to the well known nRF24L01, but operates at 433/898/915MHz instead of 2.4GHz, has a much longer range and a few extra IO pins. However the nRF905 data rate is only 50Kbps compared to nRF24L01’s 2Mbps. This library offers quite a bit of flexibility: Optional use of interrupts, 2 of the connections to the module are optional since their states can also be accessed by the ICs status register, and supports basic collision avoidance. NOTE: v3.0.0 of the library was released on 12th September 2017, the default CD pin has changed and the AM pin is now used by the library. The nRF905 is not 5V compatible, so some level conversions will need to be done with the Arduino outputs, a simple voltage divider or resistor and zener diode will do the trick, only TXE, CE, PWR, SI, SCK and CSN pins need level conversion (not CD, AM, DR and SO). The nRF905 has 511 channels ranging 422.4MHz – 473.5MHz in 100KHz steps on the 433MHz band and 844.8MHz – 947MHz in 200KHz steps on the 868/915MHz band (remember to check which frequencies are legal in your country! ), but each channel overlaps adjacent channels so there is only a total of 170 usable channels at once. Searching for nRF905, PTR8000 and PTR8000+ should yield some results for modules on Ebay and DealExtreme, you should be able to get 2 for around £10. Since v3.0.0 this library uses callbacks which are ran when events occur. If the option to use interrupts is enabled then the callbacks will run from the interrupt routine so be sure that any global variables you use in them are declared ‘volatile’, just as you would when dealing with normal ISRs. These events will wake the microcontroller if it is sleeping. The actual air data rate of nRF905 is 100Kbps, but the data is Manchester encoded which halves it to 50Kbps. The modulation is GFSK with ±50KHz deviation. The radio also adds a few extra bits of data to the address and payload; a preamble and CRC. The address is also used as the syncword and should have as many level shifts as possible. 10100110 01100101 00011010 11011010 (2791643866) would be a good address to use, but 00000000 00000000 00000000 0010000 (32) would not be. The CRC is used to detect errors in the received data. Having a CRC doesn’t eliminate all bad packets, there is always a small chance of a bad packet passing the CRC. Using larger CRCs helps to reduce that chance. When the CRC is set to 16 bit the radio uses the CRC16-CCITT-FALSE (0xFFFF) algorithm. I’m not sure what it uses for 8 bit CRCs. The sizes of the address, payload and CRC can be adjusted for a balance between throughput and latency. Throughput is how much useful data can be sent (the payload part), assuming no delays for setting the payload. Latency is how long it takes for the transmission to complete. Switching from standby mode to receive or transmit mode takes a maximum of 650us and switching between receive and transmit modes takes a maximum of 550us. tstartup is the time to switch mode as stated above (650us / 550us). tpreamble is 200us for the 10 bit preamble. Naddress, Npayload and NCRC are the address, payload and CRC sizes in bits. BR is the bit rate which is 50,000. A note to developers: Before v3.0.0 this library would load the address bytes in reverse order, keep that in mind if you’re using an old version of the library to interface with other radio systems! Yup. You could see if the ping example works as that has the send in a while() loop, if the example doesn’t work then you might have a wiring issue (probably to do with the CD pin). it does not work 🙁 however, i checked the CD pin and it is connected to pin2. all the other pins are also connected correctly. Did you load ping_client on to one Arduino, and ping_server onto another? There’s definitely a wiring issue if pings don’t work, could you post some picture of your setup? Yes we did. where can i post the pictures? do you need the picture of the connections? You can upload to https://imgur.com Yeah, pictures of all the wires connecting the Arduino to the radio module. we tried again, it’s not ping time out anymore. but on the other side, it only outputs waiting for ping. Ah, you’re using a MEGA. Have you changed INTERRUPT_NUM to 5 in nRF905_config.h? oh, i’ve changed it before but now that i have checked it, it went back to 1. ugh. now it is working thank you ^_^ but there are many garbage data, how can we eliminate or lessen those? Hah alright 😛 Can you post a screen shot showing the bad data? Nothing happens in the server side after that. I’m guessing the receiver isn’t working? Would you have any suggestions? I’ve been racking my brain all day. I’ve used recommended below connections: Thank you for your help and time! Hi Brian, if the ping time is 0 or 1 then there is a problem with the client side, as it already takes around 6ms just for the radio to transmit the packet. What does the debug example print out? Thanks for the reply! Sorry in the client side it does display 6ms afterwards, but the issue is the receiver I believe. It’s just stays at the “waiting for ping….” print. Are there different pin connections for the receiver side? I have both wired exactly the same according to your tutorial. Hello Zak! I would like to ask if it is possible to increase the maximum payload in your program from 32 bytes to 64 bytes? If yes, how can we implement it? Thanks! No, 32 bytes is the limit as that the maximum payload the nRF905 radio can send. Hey 🙂 I have another question. The serial monitor freezes when I send a frame. What can i do to solve this? 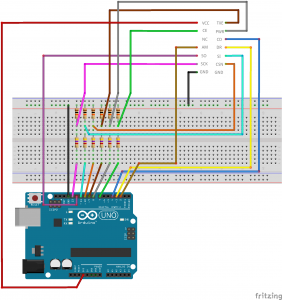 What sketch are you running on the Arduino? You’ve got a lot going on there, I don’t really have time to go though it all. Though, I’d try to avoid using strings as they tend to eat up a lot of RAM, which the Arduino doesn’t have much of. Instead of strings use byte arrays or char arrays and use numeric values or characters to indicate what type of packet it is. could be the packet type (1 = ENQ, 2 = ACK, 3 = EOT …),  could be the message length and the rest are the bytes is the message data. You don’t really need CRC as the radio already does all that stuff, and if the received packet is corrupted then it is automatically discarded. I’ve tried using bytes but i can’t put it in an if else condition even if i tried to convert the received bytes into string. What can be the solution to this? I’m not sure what you mean by it lags? 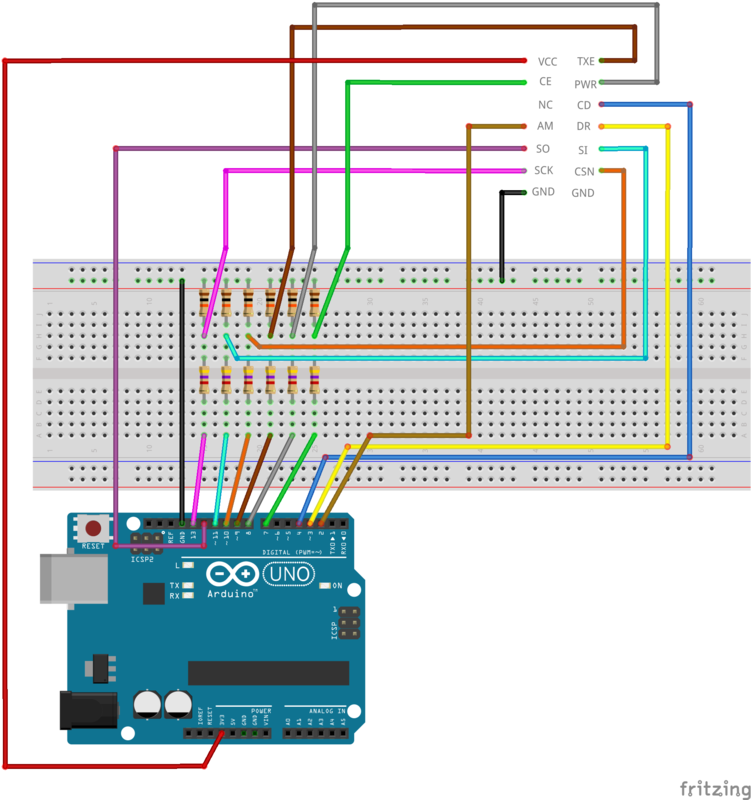 The Arduino is probably crashing or getting stuck in a loop, what’s your latest code like? Looks ok to me, although the transmitter will be spamming out packets since it doesn’t have any delays between transmissions. Put more Serial.print debugging messages around the code, so you can see exactly where it gets to. ohhh okay i’ll try. hey, i have another question. can i put pins 2 3 7 and 51 52 53 into another input? im also using an lcd tft and the pins collided. 2 and 7 can be moved to any pin. 3 must be connected to an interrupt pin, unless you’ve disabled interrupts with NRF905_INTERRUPTS 0 then it can be any pin. Make sure you update the nRF905_config.h file. 50, 51 and 52 can’t change as they connect to the SPI bus, unless you modify the library to use software SPI then you can move to any pin. 53 can be moved to any pin. SPI pins (50, 51 and 52) can be shared with multiple SPI devices. With the INTERRUPT_NUM set to 1 the debug sketch seemed to work OK – see below. But when I set it to 5 it runs with errors – see below. All registers read as 0xFF or 0x00! Is the nRF905 connected correctly? With INTERRUPT_NUM set to 5 and the Mega set up as the ping server I get communication, but the data appear to sometimes scramble – see below. I have the wirelessSerialLink and my own sketch working with the two Unos, but neither work with the Mega. Any suggestions would be much appreciated? Hey Michael, odd that the debug sketch doesn’t work with INTERRUPT_NUM 5, since it doesn’t use any interrupt stuff to read the config registers. Everything else seems fine. Since the nRF905 is a 3.3V device and the Arduino uses 5V signalling, how are you doing the level conversion? Is the nRF905 the only thing connected to the Mega? Thank you, this saved me a lot of trouble. I had to rename *.c files into *.cpp to get this working (Xubuntu 16.04 + default Arduino package), but maybe it does not happen on other Arduino IDE installations? Hey, for Arduino you should use the files from the Arduino folder, which are already .cpp and include example code written for Arduino. I am using your software, actually I rewrote it a bit for my needs, but still works fine. I am currently using my module only in receive mode, in 868 MHz range. The only problem I have is the limited Rx range: if the transmitter is closer than 1 meter, all data is received OK. But I cannot receive anymore data if i place the transmitter more than 1 m away form the module. Could you maybe recommend what can I do in order to improve the Rx performance? Hey Steve, nRF905 modules are usually only tuned for 433MHz operation. Using a different frequency band will result in very short range as you’ve found out. I don’t think I’ve came across any modules for 868MHz so you’ll probably have to design the module yourself, the nRF905 datasheet shows what components are needed for each frequency band. First of all thanks for your work ! I was able to make this working the client and server examples using an arduino UNO. I didn’t use power level conversion and it was still working, is it normal ? Then I tried with an arduino mega, changing SO SI and SCK pins as expected. I also updated the config.h changing the INTERRUPT_NUM to 5 as requested. I finally achieved make it working. Now it’s working even if it’s surprising that I need that knowing that I’ve already changed the INT_NUM to 5. I have a TX which send a string every 100ms. I have a RX which receive this string and analyse it : I added a TIMEOUT if the RX doesn’t receive anything during 1 second (in order to stop motors running in my specific case). To test that I disconnect the TX and it’s working fine (the RX stop). But when I connect the TX again, this takes around 5 seconds for the RX to receive again (in the meantime I display “timeout”). Does this time to reconnect is normal ? Do you have some advices to imporove that ? Hey Jean, I’ve just put a fix up on Github for the INTERRUPT_NUM issue, shouldn’t have to use the REG_EXTERNAL_INT stuff anymore. About the slow reconnect, add some Serial.println()s in your code to see where it’s taking its time. It should work straight away since there aren’t any connections being made with the radio modules, they just transmit to everything as fast as they can. Without any level conversion you are applying 5V to the IO pins, which are only meant to have 3.3V. This is slowly damaging the chip, and it’ll probably start going weird after a while. how can i make communication distance longer? i succeed to test communication and after it, i tried to get “test” word by getting more distance from server. however, after 100m, the connection is lost. i expected it should be at least 200m (there was no obstacle). can you tell me somthing about it? Heya, how close to the ground the modules are (put them high up in the air), the antenna (quarter, half, full length), antenna gain, orientation of the antennas and impedance matching circuits on the module can all cause the range vary. 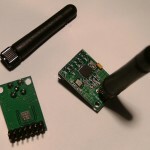 Try different antennas or use a module that has a RF power amplifier built-in. great library – thank you for your work! I am using both an UNO and an ATMega Nano. I know I have to change the config file, however since I am using the library for both boards, compilation becomes a pain if I am testing different things out on both boards at the same time. Is it okay if I “re-publish” the library in my local system as a permanent change for the ATMega board? I do not intend to change any of your credits etc. If you’re using separate sketches for each board then you can also copy the .cpp and .h files from the src folder into the sketch folders, then they’ll each have their own copies of the library. Hello zac. Sorry for my bad language, I’m French. Thank you verry much for your library. I make a chronometer wireless with Nrf905 433Mhz, 10 dBm. It works good but how can i make communication distance longer? After 25m, the connection is lost. (there was no obstacle). I would like near 100m. 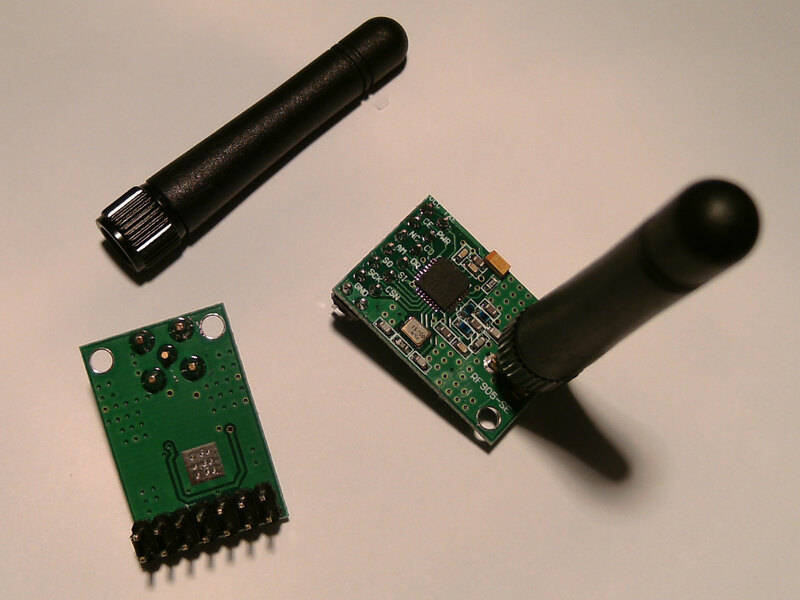 Hey Pilatte, you could try different antennas like THIS or use an nRF905 module with a built-in RF amplifier like THIS. Nothing to do in the sketch or library? Your RF amplifier is too expensive for my project and I would like a little antenna. What do you think about this to put between the Nrf905 and his antenna? The sketch/library can only adjust the transmit power, which is already set to the max (10dBm). That linked amp might work, however I’m not sure how it will react when the module transmits something. Ok. I will try more options. Thanks for all the work you have put into this blog Zak – it is greatly appreciated. I have managed to get an arduino uno to send data to an arduino mega. the data represents the position of a joystick. 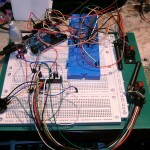 The mega reads the data Ok . My problem is that the mega controls a DC motor and uses a feed back loop. The feedback loop reads an encoder so I need to implement an interrupt. Unfortunately as soon as I add an attachInterrupt statement I get an error when compiling as below. It would appear that I am not able to assign interrupts to pins on the mega while I use your library. Is there a solution for this ? In nRF905.cpp remove the line with ‘REG_EXTERNAL_INT_CTL |= BIT_EXTERNAL_INT_CTL;’ and change ‘ISR(INT_VECTOR)’ to ‘void nRF905_processInterrupt()’, then modify your nRF905.h to match the nRF905.h from the link above (only need to change 3 lines). Oops, the detachInterrupt(…) and attachInterrupt(…) lines are the wrong way around, swap them and see what happens. I have decided to improve my software on this project. After making the mods you suggested a couple of months ago the sketch compiled and down loaded and the device worked. However now when I recompile the original software the sketch no longer compiles. I have checked through carefully to make sure that none of the modifications you suggested have been corrupted and have not found any problems. Hey Roy, I’m guessing you’re trying to use the mods with v3 of the library? A lot has changed so any mods probably won’t work now and probably won’t need anymore. Some function names have changed and it now uses callbacks, so you’ll have to look at the examples and update your program to work with the new library. The power off seems to be kind of bugged, if I do not periodically disable the clock output its power consumption dies increase to about 300uA. But if I disable the clock output every second (it was never enabled to begin with). it (and the ATmega) are using about 5uA. Do you know why this ist? Is the 300uA including the ATmega? The power down function only changes the state of a pin from HIGH to LOW, it doesn’t touch any register settings. Hi. Thanks for investing time in this, first of all. I’ve built a receiver on an Arduino Ethernet and a WiFi, using this library. I’m sniffing data between commercial home automation devices. Thing is, I seem to be missing [at least] a byte of information. I connected the HA device via USB, and via the Arduino console I can see it’s output, an so see what values it is receiving. I only changed the CSN pin for the Arduino Ethernet, from 10 to 5. I receive info from the HA device, 16 byte buffer, and tried to reverse engineer the values, so I can send them out via mqtt. From the console, I can see that there should be a value of decimal 636 in here. This is hex 27C. The first four bytes are the same for all readings, and seem to indicate some sore of device address. The fifth I don’t know what it is, but also never changes. The sixth seems to be indicating the port that the value is received from, E3 is the one I’m looking for it seems. Now, the 2 is the 2 from the 27C. If the value changes to hex 3? ?, I see that change into a 3. But, the 7C is nowhere to be found. These readings occur quite often, and the serial monitor displays a different value received each time, but the buffer display from the Arduino Ethernet is often the same value as before. Djeez, I hope this still makes sense. Anyway, I believe that the 7C part is sent between HA devices, but doesn’t show up in my buffer. Is this in any way something that sounds familiar? Hey Hans, there’s no known issue with missing bytes, when nRF905_read() is called it just reads exactly what the nRF905 has received and places it into the provided buffer. How do you know that there should be a 0x7C byte? Hi Zak, thanks for the reply. Yeah, the question was sort of a long shot. The HA receives data like current power consumption. The console output displays what it receives, but not in buffer but interpreted form (so current power usage is 600W). I have other readings (daily kWh for example), that consist of multiple bytes, which are received in reversed order. From those it also seems that the missing data should be in the byte after E3. I thought I might have similar issues as the bit shift issue mentioned in one of the comments. But I have stuff working on a NodeMCU also now, which is 3v, without level shifter, so that’s probably not it. Thing is, although I don’t know what I’m doing, I seem to have had some luck. The first three bytes consistently show addresses of slave devices that the HA device is receiving from. When the HA displays it received something, so does the nRF905. I can consistently get 868MhZ thermometer sensor values this way. There’s no garbage received by the nRF905. Since that address data is consistent, the rest probably is also. That makes me assume that I’ve tuned in to the right band and channel. Yet comparing data I receive with the interpreted data the HA is displaying (which means that it IS transmitted from slave to HA), it looks like I’m missing a byte of data for some slave devices. Since the HA code is not public domain, I cannot check any radio settings, so it’s hard to figure out what I’m doing wrong. Anyway, I will keep playing with it. Thanks again! Oh, that would have been cool. But it’s not necessary anymore. I found the configuration (Band, channel, crc and stuff), so I was sure I had my receiver configured correctly. Still missing some data. In the end, I connected the receiver to a laptop, and walked downstairs, away from the HA and close to the slave device that is actually sending the data. Guess what. No more missing data. So it was interference, I might have been reading ACKS instead of the source data, or it was just a distance thing, or maybe a combination of both. Super glad it works though, and was certainly not an issue with the library. Again, thanks for helping me out here, sorry to have waisted your time. Hah that’s alright 😛 Though, if CRC is enabled it will detect the missing or corrupt data and report an invalid packet or nothing at all. But with raw radio stuff data doesn’t go missing, it just gets corrupted and the amount of data will stay the same. I have two standalone arduino running at 8 MHz and the ping client- server example works well. My real world sketch however needs to use the timer1 interrupt which gets triggered every 10ms to do some housekeeping. I’m not sure if this is interrupting the NRF transmission but when the same ping code goes into my code , it does not function and says Packet Invalid. Hey Srikanth, by default the nRF905 uses 2 interrupt pins (AM and DR) where the timing of when these interrupts fire is important to correctly detect valid and invalid packets. If your interrupt takes a long to time to run then it could cause the library to mess up. You could try disabling the AM interrupt (NRF905_INTERRUPTS_AM 0 in nRF905_config.h), but then the invalid packet and address match callbacks won’t work (invalid packets will just be ignored), though that might be fine for your application if you’re not bothered about those two. Thank you Zak for your quick reply. I tried disabling all interrupts (NRF905_INTERRRUPTS 0 and NRF905_INTERRUPTS_AM 0) as I realized (too late) that my circuit uses the AM pin to run a LED matrix. I disconnected the connections to bot AM and DR pins as these are needed to be connected only if interrupts are used. But now the ping client just times out and the ping server waits for ever for reply. Are the ping client-server example not made to work without interrupts ? As mentioned in config.h, I have set NRF905_INTERRUPTS as 0 and NRF905_DR_SW as 1 and NRF905_INTERRUPT_AM as 0 and NRF905_AM_SW as 1 so apparently both AM and DR can be left connected as checking is done in software though maybe slowly. However the ping client times out every time and the ping server hangs on waiting for ping. Incidentally the pins have been left connected though disabled in config. Ah, to use the library without interrupts the nRF905_SERVICE() function should to be called as often as possible (which none of the examples use at the moment). See if you can get it working by sticking nRF905_SERVICE() in the various while loops of the ping examples. So I have worked around the problem for now. would have been convenient if the AM had worked on A0 though. Thanks a million Zak for your great library and promptness in your replies. I can see you have been keeping that up for over 4 years ! Regards ! A0 is only a pin change interrupt like all pins (PCINTx), but the library only supports using external interrupts (INTx). This is because PCINTx interrupts are shared between multiple pins and Arduino doesn’t have any built-in way of dealing with them, which makes it hard to have two or more libraries using PCINTx stuff. Though it should be pretty easy to modifiy the nRF905 lib to use PCINTx if you wanted to. One more question. Now that I have them synced the receivers usually lag 1 sec behind the master. As the typical ping time is only 16 ms, is there anyway I could get them to sync better than that ? Like say calculate a transmission delay and add that ? I’m very tempted to add 1 sec via software at the receiver and am sure we could not make out the difference but is there a better way of getting say a 100 ms sync ? How do ZigBee’s synchronize time ? I’ve no idea how ZigBees do it. I got my NRF905 synchronised clocks to work based on your replies and they are working satisfactorily now. The next thing I need to do is that there are 5 -6 such devices one on each floor. I need messages to be passed by anyone to the other. I do not want to assign a separate address to each device as I want the single message to be broadcast to all the other 4. I have checked separately that my messages can reach from one floor to 4 floors away as they are almost in line of sight in the stairway. But as a failsafe, , the plan is that each device has a software device number (say one to 5) . A message is sent by device 1. Devices 2-4 receive it as they have the same receive address (as does device 1). After a latency equal to 2x (message transmission time) x deviceNum the receiving device also broadcasts the message again . The message also contains one byte info about who has initiated it and who is re-transmitting it and a message ID no. So that if the same message ID has been just received within the last 1 sec, it is ignored. That way I can ensure that even the last most distant nRF receives it. That way the same message gets sent 5 times, one by each node so that it is sort of like a rudimentary mesh network. My question is if all Rx addresses are the same, will the first device have a problem by its own message echoing back to it or will that not happen as the device will be in transmit mode and hence its own message will not be seen by it ? Will this system work for a few nodes ? It is basically a signalling system in a small 4 floor clinic where the device at each floor will be able to transmit different alarm conditions to each floor – like fire, earthquake, cardiac arrest, theft etc, so the entire personnel are immediately alerted. Good stuff 🙂 Transmitting radios cannot receive anything, even their own transmissions, so no need to worry about echoing messages there. It sounds like your mesh idea should work, but even though the radios already have a basic collision avoidance system you might still need to see about the problem of multiple nodes transmitting at the exact same time. I’ve not done mesh networking stuff before, so you’ll have to do some experimenting. Thank you. The problem of collisions due to transmitting at exact same time is unlikely as emergencies happen very rarely in a smaller clinic and even if they did, to have two people simultaneously signalling a different emergency on each floor within a second or two of each other is very unlikely. Yes I’ll expirement and let you know the results. Regards and Thanks once again. I have just begun playing around with Arduino and the nRF905 module. I am using an IDUINO UNO and an IDUINO MEGA, each configured with an nRF905. I’ve loaded the nRF905 library and the lowpwr_client and lowpwr_server sketches and managed to get everything working OK, noting the different pin connections required on the MEGA. communications are OK. But as soon as both function calls specify the 915 Band, communications fail. If I just change the Channel (using NRF905_BAND_433 in at least one of the function calls), things only work if both function calls specify the same Channel, as I would expect. But I would also have expected things to break if the Frequency Band settings didn’t match. Can you tell my why this would be so? I’ve also read that the nRF905 units are usually just tuned to the 433MHz Band, and need to be ‘retuned’ to operate in the 915MHz Band, but I’ve been unable to locate instructions on how to achieve this. Any advice on this front would also be appreciated. Call it a therapeutic wait if you like, but things seem to be working now, after disabling LOW_RX and bumping up the transmission power to 10dBm. Hey Pete, I’ve not sure about this myself, but the modules being able to communicate when set to different frequency bands could be because the receiver is picking up a harmonic of the transmission since channels in the 433MHz band are exactly half the frequency of the same channels in the 868/915MHz band. Tuning the radio for different bands requires moving around various capacitors and inductors and adjusting their values, there are schematics at the end of the nRF905 datasheet. Not particularly easy. I may be on the wrong track here. Double checked pinouts – all wired correctly. I am using 2 NANO boards. Cannot get Client and Server to work. I looked at the pinouts of the UNO vs NANO and one shows the INT0 and INT1 as being different on the two boards. Is this true or can I stick to your wiring as published? Hi Zak – Many thanks for the response. I have a tacky bit of wiring on some veroboard for each module so probably best not to embarrass myself. I’ll double check everything and see where I am possibly tripping myself up. Any tips on how to carry out a functionality check on each Radio Module? I also understood the Nano and Uno to be the same in terms of pinouts. Just had one diagram that showed Int0 and Int 1 on the Nano as opposite to the Uno. Appreciate your willingness to help newbies like me. Hello, Zak, and thank you very much for your work on the NRF905 library! I have managed to get the wireless serial link example to work, and now I want to send some data from one Arduino to another. All examples I can find using the NRF905 is sending “Hello World” or some text phrase. Can you help me in the right direction? To simplify, I dont want/need the receiver to send anything back to the sender. Hi Zack. I checked all lines and wiring is good. Used a 4k7 and 3v6 Zener for level changes. Keep getting a Ping Time Out on Client side. Any bright ideas as to how I can do further fault finding? Hmm, have you tried running the debug example? What does it output? Hmm, try connecting the module directly to the Arduino IO pins without any of the resistors and zeners, it’ll still work just try not to keep it that way for too long. Firstly I apologize for my English, I am Belgian. A big thank you for your work! Nevertheless, after several tries I do not have to install the library on my arduino. When I put “add library.zip” the following error appears: the specified folder does not contain a valid library. In the commantaires I saw that you made 2 other .cpp and .h files but it still does not work. I want to use this library to decode a 868.3 MHZ signal in order to turn on and off the lamp with the arduino. Hi Cyril, I’ve not tried the “Add .ZIP library” thing, so I don’t think that method will work. Follow the install instructions on the GitHub repo page (the old fashioned way). Most nRF905 modules are tuned for 433MHz and don’t work at 868MHz. It’s also very unlikly you’ll get it to communicate with the lamp unless it also contains an nRF905 radio chip. You might want to open up the lamp to see what kind of radio it has first. Have you ever encountered this error? If so, how to solve it? On the datasheet of the chip nrf905, it is indicated that it can receive and transmit at a frequency of 868mhz, is this a lie? if not, is there any way to impose this listening frequency on the nrf905 chip instead of 433mhz? The RF receiver of the lamp is of the brand “Niko”. Once the right frequency band is chosen, should not we be able to capture any existing signal in this band? I think you may be mixing different versions of the library together. Make sure all the files are from the latest v3.0.0. The nRF905 can operate at 868MHz, but the external components on the modules need to be the correct values for the different frequency bands, there are schematics for each band near the end of the datasheet. To receive packets from the lamp they must be in the same format as described in the “Nitty-gritty radio stuff” section of the blog post. The frequency. modulation, deviation, bit rate, encoding, preamble, sync word/address, payload length and CRC settings must all match, which is very unlikly. On my transceiver module there is an extra pin labelled “uCK” between CE and AM. What does this pin get connected to? uCK is a clock output from the nRF905. It doesn’t need to be connected anywhere. It would be nice if the Read routine returned the number of payload bytes read. Other than prefilling the buffer with something that you can test for, there doesn’t seem to be a neat way of doing it. It must be available somewhere because the packet layout has a terminating CRC. Thanks for a great library. Hey Peter, there’s no need for the library to return the number of bytes read as it will always read the requested number of bytes, unless you request more than NRF905_MAX_PAYLOAD (32) in which case it will be capped at NRF905_MAX_PAYLOAD. I have potentially a bunch of transmitters with variable length transmissions. So it would be nice to ask for max-payload and ask how many actually came in. Also the received number appear to often have leading nulls in the buffer, but the packet status reports OK. I will get a little printout if I can. Thanks for the quick response to down under. The nRF905 only supports fixed length packet transmissions. Even if you specifiy a shorter length when calling nRF905_TX() it will still transmit the fixed payload size (default 32 bytes, the remaining bytes will be garbage). Looks like I will have to pad out to a constant length, and change the payload size to that, or just bugger it and transmit 32. On the Rx side, it seems that I might be able to detect a complete package by checking DR (or D3) within a read sequence. It appears to go LOW at end packet. The little lady is asking me to clean the shower, so mundane things intervene. Hi Zac. I’ve downloaded the files from github and got the libraries sorted after a bit of playing around. Now, when i launch the arduino IDE and try to open/run one of the example sketches (ie. debug, ping client/server, all of em…) i get heeeaps of error messages when i hit verify. These are just some of the errors (from debug). I’m a bit noob, I can’t code what I need from start to finish so I need working codes to make a start but i am stumped here as everything is throwing error messages. Any help very much appreciated, thanks! Hey Ash, it looks like you’re using the non-Arduino version of the library. You need to use the stuff from the arduino folder in the github download. Great blog. Found it useful and I was able to send and receive packets using your library. Just a question, would it be possible to use logic level converter to bring down 5v to 3.3v for TXE, CE, PWR, SI, SCK and CSN? Yes, if the converter can drop the 5V signals down to 3.3V then it should work fine. Hello again! I sorted the library problems, cheers for the help. I’ve since got the lowpwr_server & lowpwr_client codes running. 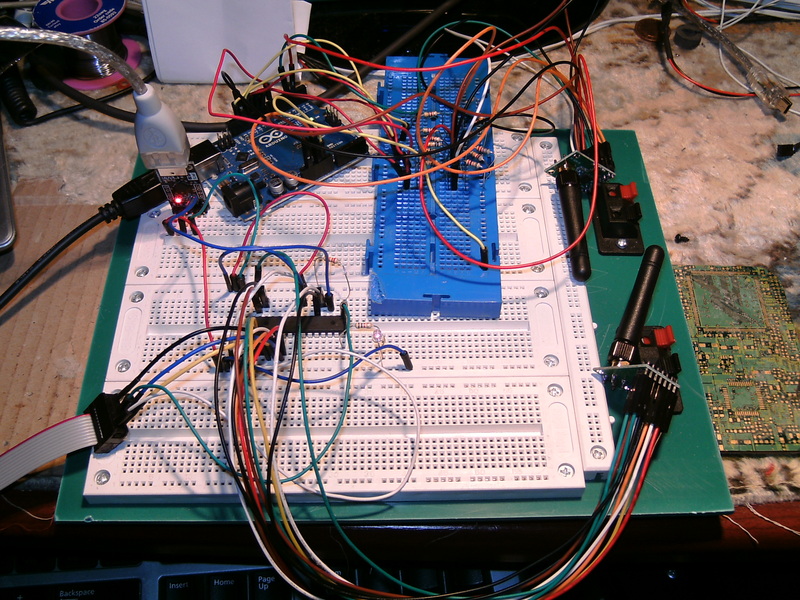 I’ve put a potentiometer into the LP_Client code, which the LP_servo then reads the pot value in serial monitor. My goal is to have one client (with the pot) which transmits to the other two, one with an LCD displaying the value and the other taking the value and writing it to a servo motor which then moves to the appropriate position. I’m getting a reading on the lcd but after the first 4 numbers it displays odd characters (i think its an array and the odd characters are empty spaces?). And with the servo I cant get it to read the transmitted pot value. I think the problem is the type of data being sent, I’ve tried changing the char to int, int8_t, long etc but to no avail. Lastly, how do i change one of the server codes address so they don’t clash with each other? (I haven’t tried running all 3 yet, only client to server lcd OR client to server servo. The data array has a length of NRF905_MAX_PAYLOAD, which is 32. Since you’re only writing to the first few bytes the remaining bytes will be random, which is what the odd characters are. You need a way of telling the receiving end how many bytes are actual data (usually the first byte stores the length, but since you’re using sprintf the string will be null terminated then you can just use lcd.print(data) instead of write(data, length)). The server code also has a lot of delays where things might be missed, and it doesn’t put the nRF905 back into RX mode after receiving a valid packet. Both servers can have the same address, then they’ll both receive the same transmission. The address can be changed by the #define RXADDR value at the top of the code. I hope this helps, there’s a lot of things to learn about! I am working on a project in which I want to replace the outdoor sensors of my weather station (Fine Offset WH1080) with much better ones. I have for instance a professional Thies anemometer that I would like to hook up. Your driver looks like a good piece of software for me to start with. My first idea is to see if I can receive the packets from the existing transmitter and use lessons learned at a later stage to replace the transmitter by an ESP32 connected to an nRF905. There is a lot of information on the web on how the WH1080 data packets are build up, but there are also a few things I don’t understand. For instance, how do I determine the exact frequency and device address to listen to? I am also interested to know if your driver uses the ShockBurst mode. It would help me understand the code better. What would be the best sample code to start with, considering what I am trying to make? ShockBurst is a marketing term meaning that the RF chip does all the hard RF work instead of having the microcontroller do it (packet assembly, CRC etc), which is something pretty much all RF modules do anyway. From what I can tell the WH1080 weather station doesn’t use an nRF905, and since the nRF905 has very few RF related configuration options (modulation, bit rate, packet format etc) makes it impossible to use it for your project since the configuration won’t match the transmission format. It seems a lot of people use an RFM01 or RFM12B module with a Raspberry Pi. Thanks for your incredibly fast answer. 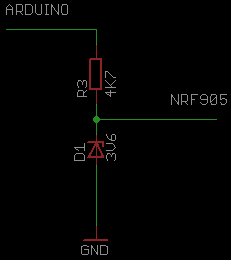 It’s good to know the nRF905 is a dead end. I will switch to either an RFM01 or a CC1101, which sounds promising too. I happen to have one lying around of each. I already wired up the nRF905, but it’s a hobby so who cares. 😉 I don’t want to use an RPi though, I don’t think it is suited for what I have in mind. It will have to go into the mast on my roof. I have a question about the nRF905 module. I tested your libary for sending a single temperature value. That works very fine. Thanky you for your work and the good tutorial!! For my second project I want to replace my old garage transmitter (for a longer range). I tried to find out which data the garage transmitter sends by closing the door, but the problem is, that the nRF905 always need a special adress (adress match). Is there s possibility to recieve every data with the configured frequenz channel, to find out on which address my garage opener sends the data? If I want do transmit the same data to 3 or 4 nRF905 modules, how should I configure the TX Module? Is there a kind of public adress (or public broadcast) on which every module recieve data? Or do I have to send each one individually (serial one after the other)? Hey Jorg, there’s slightly more to radio stuff than just what data is transmitted; modulation, encoding, data rate and deviation are some of the things that need to be known about the transmission. 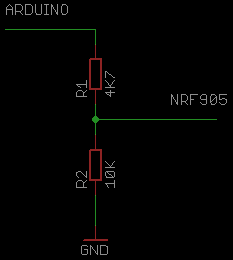 The nRF905 is fixed to 2-GFSK modulation, manchester encoding, 50Kbps data rate and +-100KHz deviation. If the transmitter doesn’t use these exact settings then you can’t use an nRF905. Si4463 and CC1101 are some radio ICs with many more customization options. You could also try looking into RTL-SDR, very useful for radio debugging. There’s no broadcast address on these modules. If you want multiple modules receiving the same transmission then set the same RX and TX addresses on all of them and filter out the transmissions you don’t want in software by using your own addressing scheme as part of the payload. i like the range advantage of a 905 compared to a nrf24 but the code is just crazy, even a lora code is much simpler than this. i have a base location with a remote location holding relay units. you see what i mean, the nrf24 is simple simon, too easy but the range is a joke. the lora has kilometres of range i will never need, and the cost and size not right. so perfect answer is using the nrf905, IF i can work out a way to simplify the code so it is not a nightmare of packet after packet of garbage just to send an on or off request. Could you suggest to me a way to get the nrf905 code so straight forward that it can be run to do what i need with the coding effort i use right now on the nrf24? If you can i will personally see you as my god. Hey D-man, could you upload the crazy code to http://pastebin.com? I’m guessing the library is just being used wrong. The main difference between this library and most other libraries is that this one uses callbacks which are ran straight from an interrupt, this allows much lower processing latencies and increased throughput, especially if you have a large program. I see that in the .cpp code you have two callbacks not mentioned – NRF905_CB_AIRWAYBUSY and NRF905_CB_AIRWAYCLEAR. I was trying to use these callbacks just to check if the one NRF905 I have at the moment is working. It looks like these callbacks are not implemented as yet. Is that correct ? Hi Geoffrey, I think the main reason I didn’t implement those airway callbacks is because the library already uses both interrupts inputs on the Arduino Uno for the DR and AM pins (the callbacks are called from interrupts). A 3rd party library is needed to use other pins as interrupts (theres a few libraries around for this, search for “arduino pin change interrupt”). If you’re using something with more interrupt pins like a Mega then you can use the attachInterrupt() function on that pin which will then be ran when ever the CD (carrier detect/airway busy) pin changes. There’s also the nRF905_airwayBusy() function if you only want to poll the status. Hey Damien, no the nRF905 does not have any way of getting the signal RSSI. Ok, thank you, Zak, any idea of another 433 MHz transceivers I can get the RSSI and use it with my Arduino board. Thank you Zak, your are the best !